Evermine, online at evermine.com, is the destination for personalized items for any occasion. Evermine offers big savings on custom products. Evermine offers labels, stickers, invitations, favor tags, coasters, cards, stamps, buttons, mint tins, and packaging. 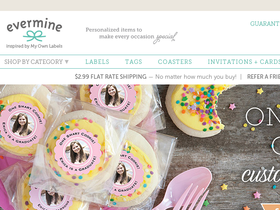 Evermine offers items for occasions such as weddings, birthdays, and baby showers. Check out RetailSteal.com for the latest Evermine discounts, Evermine promo codes, and Evermine coupon codes. Evermine offers shipping promos that change often. Stop by RetailSteal.com for the latest Evermine shipping special offers. Evermine offers standard and express shipping options. Evermine ships to the United States and worldwide. Check out the coupons and special offers and take advantage of up to 50% off select items from Evermine. Sign up at Evermine online to get a $10 discount on purchases of $50 or more. Click link. Use this coupon code online at Evermine.com and enjoy free shipping on Holiday cards. Shop online at Evermine.com and get your wedding invites from as little as $1.50 each. Shop at Evermine and enjoy free wedding, party, holiday printables for free. Click here now. Shop at Evermine and enjoy $2.99 flat rate shipping. Click here to shop. Save 40% on your clasp favor box purchase at Evermine when you use this coupon code! Save $10 on your Evermine purchase of $50 or more with this coupon code! Save 20% on your Evermine purchase with this coupon code!